UK government assessments of the potential economic impact of Brexit on Scotland will not be made public, the Brexit secretary has confirmed. But the analysis will be shared with the Scottish government, David Davis told a committee of MPs. 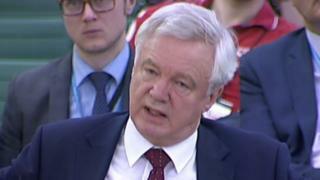 Mr Davis told the Brexit select committee that publishing the analysis could undermine the national interest. However, Nicola Sturgeon said people had a right to know how leaving the EU would affect all areas of the UK. And she said any refusal to release the information to the public would be "unconscionable". Research published by the London School of Economics earlier this week estimated the loss of economic output in Scotland could be £30bn. There have also been suggestions that the UK government analysis suggests that Scotland and the north east of England will be hit hardest by leaving the EU. Mr Davis told the select committee that the House of Commons had decided not to publish anything that would "undermine national interest". He said releasing industry-specific information was the equivalent of "giving a price list to the other side". But he confirmed the Scottish impact analysis would be shared with the Scottish government. Speaking earlier, Ms Sturgeon told MSPs: "There are suggestions that the UK government has sector specific analysis of the impact of Brexit. "There's a suggestion that it has an analysis looking particularly at Scotland as a whole but thus far there's been a refusal to publish those analyses. "I think that's unconscionable. I think the public have a right to know." She added: "It might not be in the interest of the UK government to publish these, it's certainly in the national interest to publish them." Further subjects covered in the wide-ranging meeting, which gives the conveners of all Holyrood's committees the chance to question the first minister, included the feasibility studies for a universal income announced in the programme for government. Ms Sturgeon said Fife, North Ayrshire, Glasgow and Edinburgh councils are working on pilot schemes for a citizen's income - which commonly gives a regular, unconditional payment to all citizens - and research for this would be supported by two years of government funding. MSPs later voted by 86 to 30 in favour of a Scottish government motion urging the UK government to rule out a no deal outcome in Brexit negotiations, arguing it would be an "economic and social disaster" for Scotland. They also called on Downing Street to immediately guarantee the rights of EU citizens in the UK without charges, and for the EU Withdrawal Bill to be amended to "respect the devolution settlement before it can proceed any further".